We’ve been having a rather mild summer…until now. The past few days it’s been over 100 degrees every single day. When it’s that hot, I just want to stay inside and have myself a spa party for one with something frozen to drink. 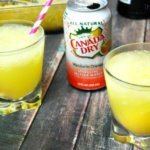 A few days ago I whipped up some Mimosa Cocktail Slushies with Canada Dry Sparkling Seltzer Water. They’re so good, I had to share! 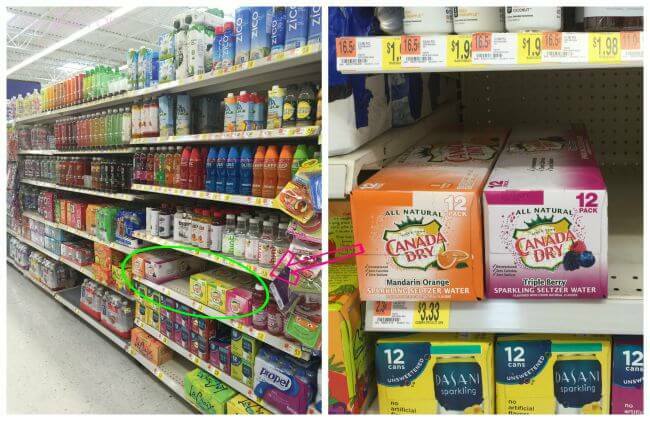 I found my Canada Dry Sparkling Water 12 packs at Walmart in the flavored water aisle. I had such a hard time deciding what flavors to take home. They all sounded delicious. I grabbed Mandarin Orange and Original flavor. I love to drink sparkling water. I use it for all kinds of drinks. My favorite is the original flavor. I love adding it to fruit juice. With zero sodium, zero calories and natural flavoring, the bubbly taste is such a great alternative to soft drinks, especially with so many flavors to choose from – Mandarin Orange, Lemon Lime, Mixed Berry, and more! 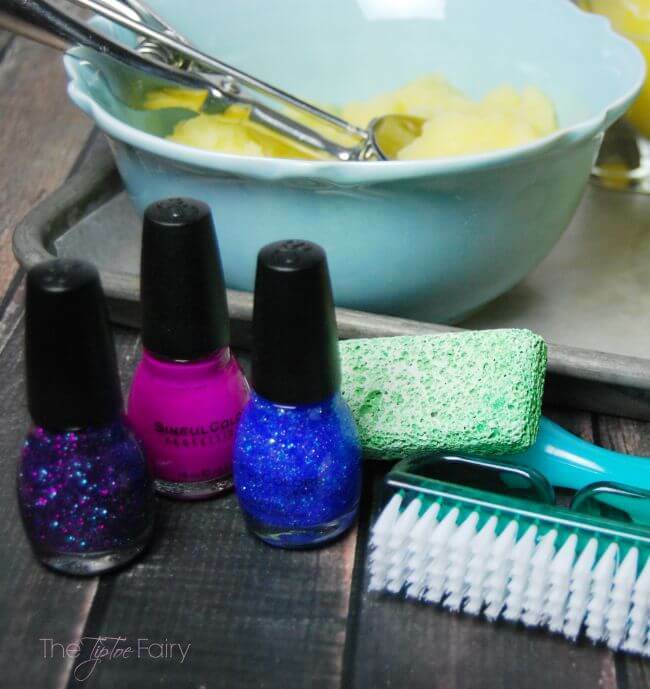 There’s nothing more relaxing on a hot summer night than a frozen drink in one hand, a good book in the other, and getting your toenails painted. You would not believe the pedicure my husband can give — I swear it’s better than going to the nail salon. I think my husband was a beautician in an earlier life. He is the one who gives me my crazy hair colors and painted toes to match! I love that he is so good at adding the sparkle for me! Usually when Nate offers to give me a pedicure, my girls want one at the same time, and he happily does it for all of us! While he’s gathering all his supplies, I make up the drinks. I make Mimosa Slushies for both him and me, and I make mocktail versions for my girls with apple cider instead of champagne. 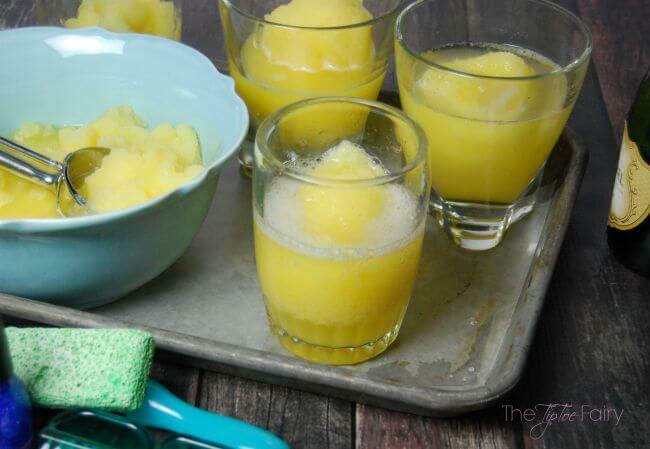 With sparkling water, these Mimosa Slushies are super simple and so refreshing. They are perfect for any summer party from barbecues to birthdays, and especially brunch! You can easily make up a tray of glasses full of granita ready in the fridge or freezer to be topped off with champagne or sparkling wine (or even a mocktail version with apple cider!). Your guests will love it! 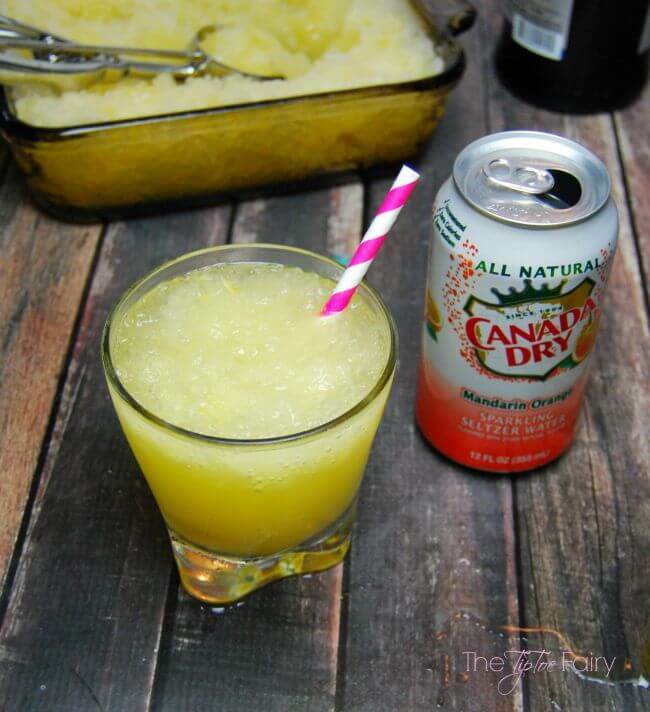 The granita is made with a bit of lemon juice, orange juice, simple syrup, and Canada Dry Sparkling Water in Mandarin Orange flavor. After combining the ingredients, let it freeze for 30 minutes. Then, use a fork to break up the frozen crystals every 30 minutes for the first hour. Allow it to freeze for another hour, and break up the crystals again. Then put it back in the freezer for a third hour, and after that, it’s ready to serve! 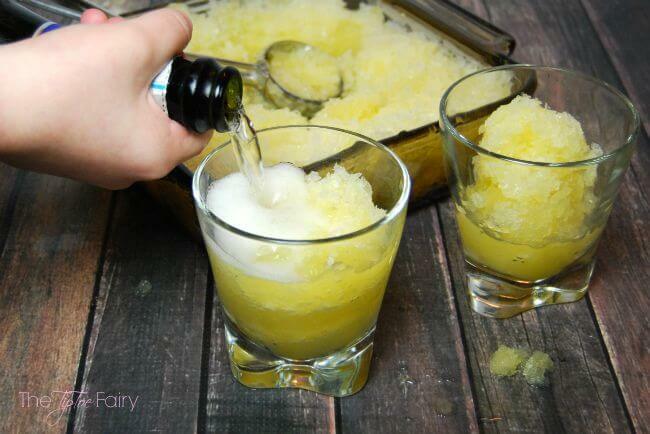 When the granita is ready, scoop about 1/2 cup into each glass and top them off with some sparkling wine. I used Prosecco. A delicious frozen treat for adults for those hot summer days. 1 bottle of champagne or sparkling wine. Mix together 1/2 cup sugar and 1/2 cup water and heat in the microwave until it boils (about 1 1/2 minutes). Stir and set aside to cool. Squeeze half a lemon for about a tablespoon of lemon juice. 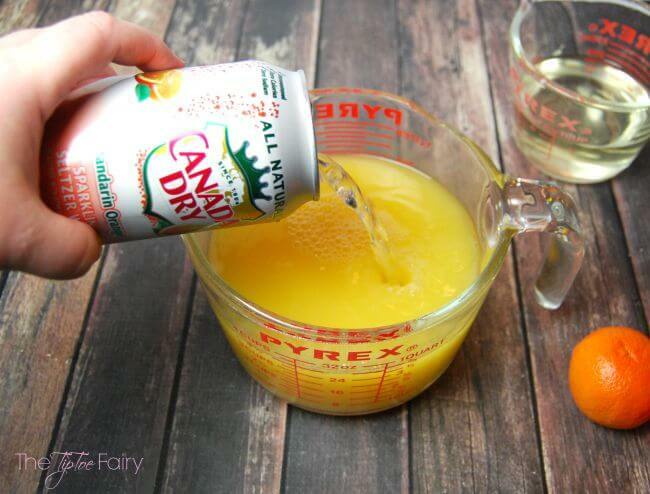 In an 8 x 8 pan combine lemon juice, 3 cups of orange juice, the simple syrup, and 1 can of Canada Dry Madarin Orange Seltzer Water. Stir or break up granita with a fork every 30 minutes for the first hour. Then, break up granita with a fork at the 2 hour mark. At 3 hours, it’s ready to serve. Add about 1/2 cup of granita to a glass. Then pour champagne or a sparkling wine over it and serve. 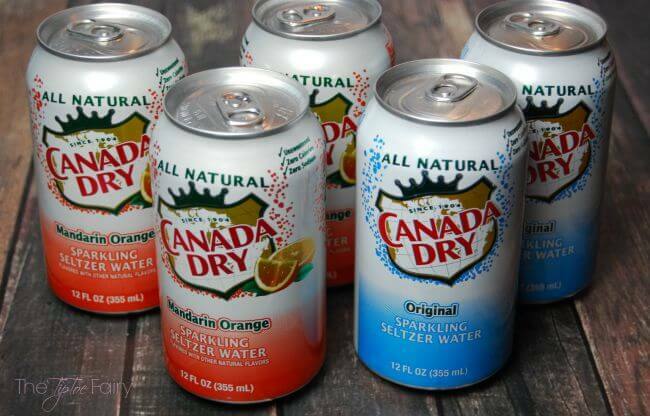 Right now you can SAVE 50¢ on ONE (1) 12-pack cans of any flavor* Canada Dry® Sparkling Seltzer Water. 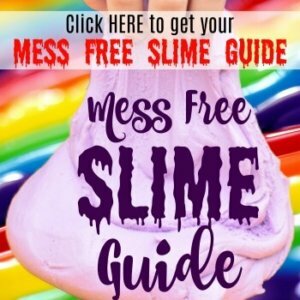 Click HERE for the coupon! What’s your favorite way to enjoy Canada Dry Sparkling Seltzer Water? Make sure to check out more creative tutorials and inspiration HERE! That sounds awesome. I can’t wait to make one. Ooh, I could use one of those right now. Spent all day in the sun and am SOOO dehydrated! I love Canada Dry ginger ale, but I’ve never had any of the other flavors they offer. 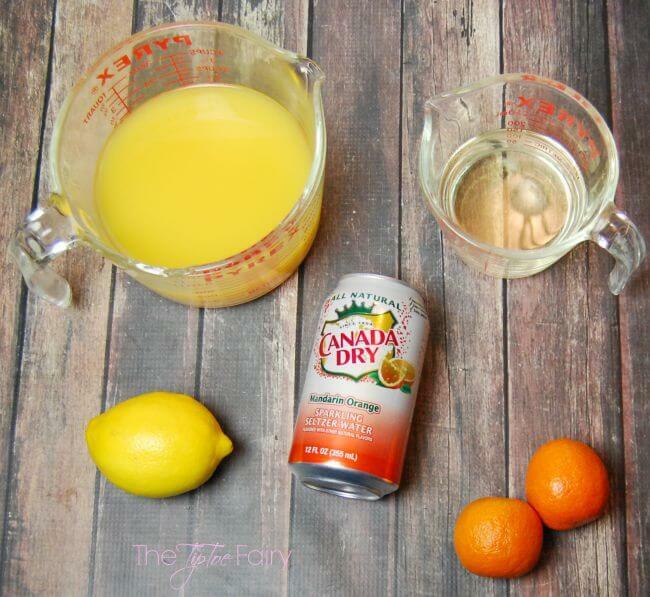 The mandarin orange sparkling water sounds great for summer. These look so delicious and refreshing! Perfect way to combat this summer heat! I do this with wine and it works perfectly, so now I’ll try this. It looks incredible! 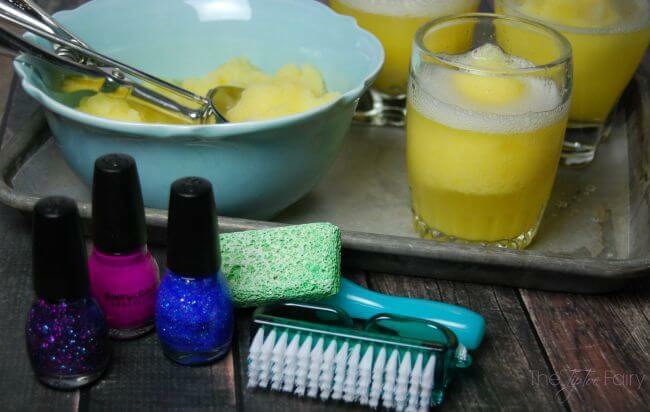 Your mimosa slushies look delicious. Would love to make these for a pool party in our backyard!